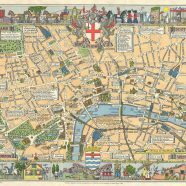 The Children’s Map of London (sometimes called the Children’s Pictorial Map of London) was drawn by Leslie Bullock and first published by Bartholomew in 1938, the edition here is I believe the original version. All royalties from the sale of the map went to the Hospital for Sick Children in Great Ormond Street (aka GOSH) which appropriately does itself appear on the map. The decorative style brings to mind an older time – perhaps the 1920s, when decorative maps were popular and the Beck tube map had not yet appeared – or perhaps even a map from the 1800s. Despite this, it was likely a good map to navigate by, as it includes most of the street network, and doesn’t distort the geography. 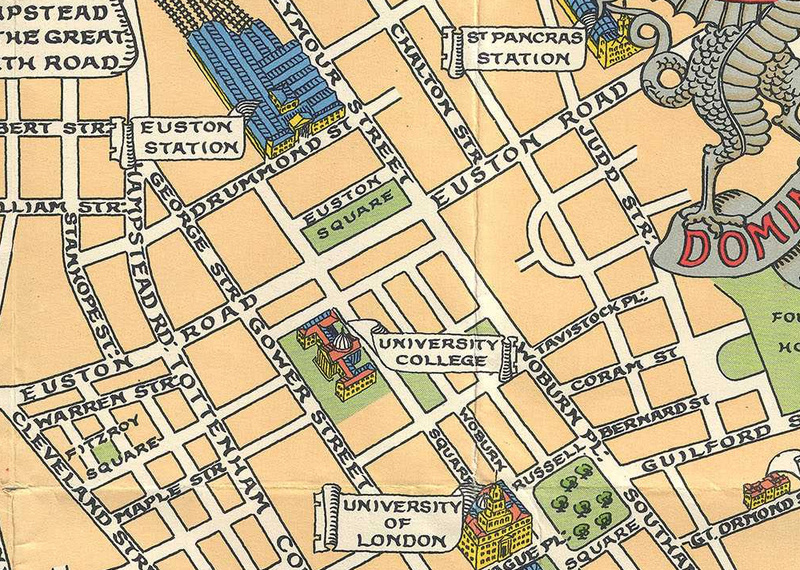 A lot has changed of course, since the 1930s – Euston station, for instance, looks a lot grander on the map, as this was before it was pulled down and replaced with a giant shed in the 1960s. It looks more grand than St Pancras even, on this map! It’s a shame also the Zoo doesn’t make it in – the map stops just south of it, but does at least include a note “To the Zoo”. 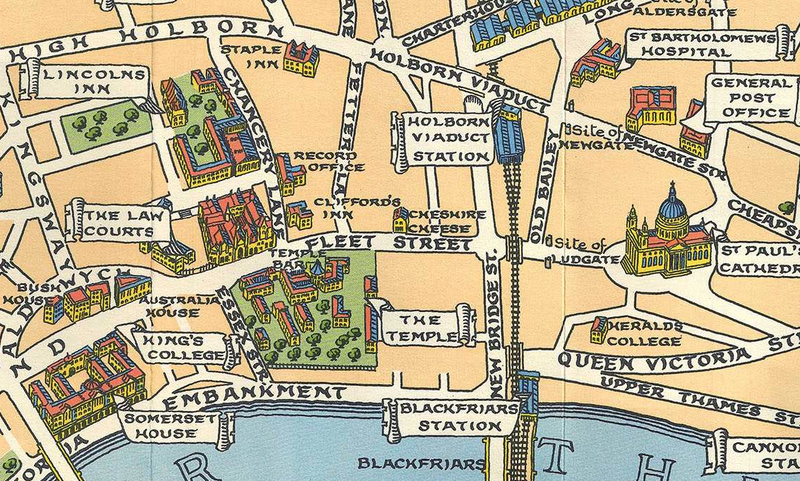 Hamleys doesn’t appear either – another institution that was certainly going strong at the time of this map. The cartography is clear and crisp, with a good balance of style and function. A yellow/red/blue colour scheme is adopted for all buildings and stations, so that the map is not overloaded with colour. It’s a lovely map to have – to navigate or to have as a wall picture. It’s a shame that it was not kept updated to the present day. The best online copy of the map that I have found, and excerpted here, is at Copernicus (see link for a larger, zoomable version). Paragraph for date nerds only: The above webpage there states it is from 1955, however it refers to Farringdon & High Holborn station which was renamed just “Farringdon” 1936 (but was likely known by its old name for a few more years), and also refers to the London Passenger Transport Board (at 55 Broadway, aka London Underground HQ these days) which only existed from 1933 to 1948. Friar Street, in Southwark, appears on the map, but it was renamed Webber Street in late 1938. Nearby Gravel Lane was renamed Great Suffolk Street in 1935! So if it is a 1955 edition, the update was rather incomplete. More likely, I think this is the 1938 original, and might actually date from the mid rather than late 1930s. Various other online references mention 1930, 1935, 1948, 1950 and 1960. 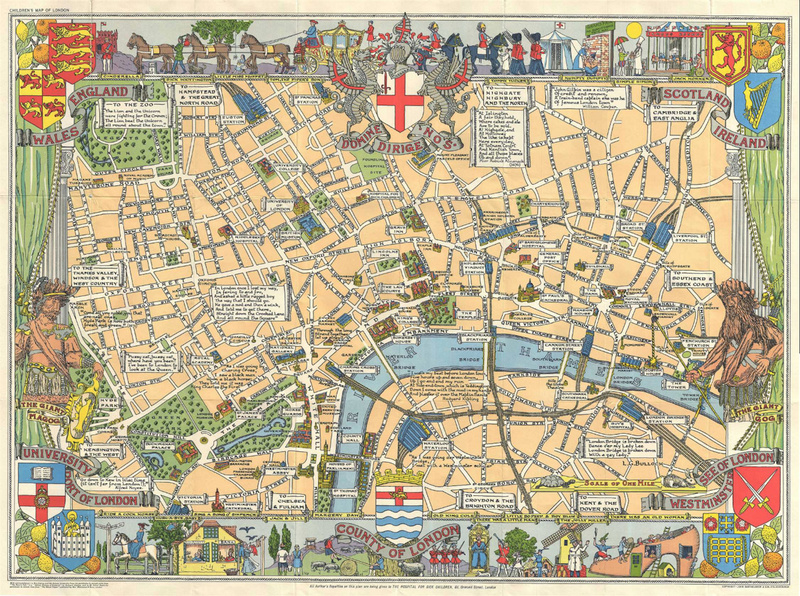 This version has a few additional labels – Bloomsbury, Seven Dials, Bunhill Fields, Shoreditch – and also mentions 1955. The author published a book containing a copy of the map, and other maps, between 1948 and 1960, so it is likely this is where the later date and edition comes from. All images of the map from and © Copernicus. Thanks for sharing a good map, will share with friends who have families who will be visiting London. Thanks,Alastair Majury. I have a Children’s Map of London. How much is it valued.